Award-winning nature and environmental writer Candice Gaukel Andrews has traveled around the world searching for and telling the stories that express the essence of a place. When a glacier retreats, it leaves behind a land scrubbed clean of life. On barren rocks and humped moraines of leftover rocky debris there is no soil — only a fresh slate upon which to build a new world. From the 1300s to the 1850s, Earth experienced a Little Ice Age. Glaciers advanced on terrain that previously had been uninhabited by ice. What is now Alaska’s Glacier Bay National Park and Preserve is some of that turf. Just 250 years ago, Glacier Bay — in the words of the National Park Service — was all glacier and no bay. A massive river of ice, about 100 miles long and thousands of feet deep, occupied the entire area. 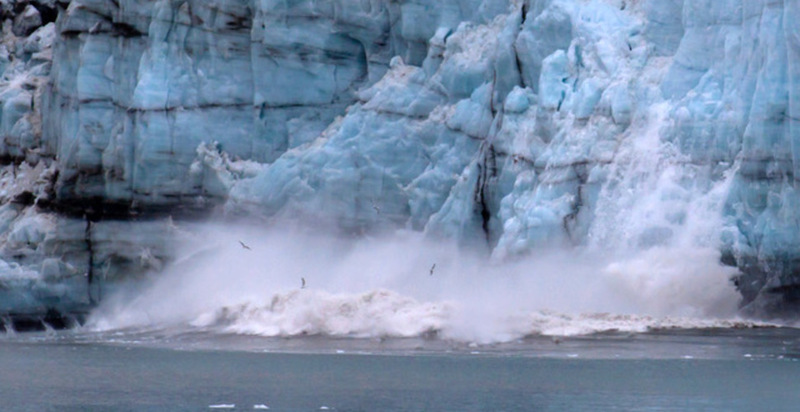 Today, fewer than a dozen, smaller tidewater glaciers remain. Sequestered at the heads of their inlets in the upper bay, they flow from lofty coastal mountains to the frigid sea, calving colossal shards of ice into the cold waters that transform into diamond-like icebergs. Travelers are drawn to this bejeweled fjord by its showy and impressive, lucent walls and floating castles of ice. National Park Service boats and tour-provider ships will take you to the waterfronts of glaciers and around the angles of icebergs so that you can watch them break apart and look into their blueness up close. A year and a half ago I journeyed to Glacier Bay National Park and Preserve because of its ice. I think all things winter are an endangered species, so I go to the icy places whenever I can. What I learned, though, when I got to this remote region, was that as impressive as the frozen faces of glaciers and icy bodies of bergs were, what’s happening on the land is equally as spellbinding. On the blank page of freshly exposed ground, lichens are the first to move in. An association of algae and fungi, lichens grow on the bare rock left behind by glaciers. Acids produced by the lichens cause the rocks to crack, making room for pieces of dust and bits of rock to accumulate in the spaces. These flecks and chips form the first soil. Soil is welcoming to mosses that then start to colonize. After them, insects follow. These small, diverse beings of the animal kingdom leave behind their waste products, which act as fertilizer for the new soil, making it even richer and appealing to other plants and larger animals. Ferns and grasses march in next, in this parade of successional world building. Their root systems stretch into and throughout the enriched soil. These twisty tentacles keep the soil stable and prevent it from blowing away, while the plant parts above ground provide a source of food that entices more sizable animals to venture into the vicinity. Fast and sturdy soil invites woody shrubs and bushes, which provide nourishment for bigger animals. Those plants further enhance the soil, preparing it for more substantial plant life, including tall trees. Trees have access to more resources: their higher leaves capture more sunlight, and their extensive root systems reach more water and soil nutrients. Ultimately, the trees will compete with and replace the smaller plants. All this leads to a climax community, where populations of plants and animals best suited to a region remain stable and exist in balance with each other and their environment. Typically, in this final stage of succession, a climax community involves a mature forest and all the organisms reliant on the towering trees. Now, to this newly restored place, come the humans, for not only is Glacier Bay a national park but a United Nations Biosphere Reserve and a World Heritage site. As such, it draws tourists from all over the world, about 500,000 per year. Most of them experience the park by looking at it from the water. Like the majority of visitors, I came for the ice. I wanted to witness rivers of it running into the sea, hear the thunderous calving of it from front edges and peer deep into its vibrant blue. Like them, I wanted a photo of myself standing near the ship’s railing, an Arctic curtain as the backdrop. Like them, I wanted to say “ooh” and “aah” in the presence of the mighty, formidable and sometimes-crumbling ice. And I did. The ice in Glacier Bay National Park certainly did not disappoint. But what surprised me is how much the land revealed. On terra firma, you can travel from the present back to the Little Ice Age. All you have to do is walk in the forested lower bay and then head north to the rocky, icy, upper bay. You can hike back through the decades as far as you like, on a 65-mile time line. On the way, you’ll actually be able to see plants and animals pioneering new ground. One evening during my trip, I attended a ranger lecture. The presenter, who had worked in the park for about 10 years, spoke about how she had studied the lichens there and the flowers that had followed them. The fungi and blooms now live among the spruces and hemlocks. But to be a bona fide forest, she firmly believed, the trees needed to receive and provide a home for Sitka black-tailed deer. For her, the hoofprint of this specific ungulate was the final stamp required to mark this world as done. Shortly after I heard that speech, a Sitka deer was spotted in Glacier Bay National Park and Preserve. So, is this world still a work in process, as science indicates; or is it fully assembled, complete and whole, per the park ranger’s predilections? I’m not sure which viewpoint I’ll end up adopting. I do know, however, that I’m particularly fond of the construction materials that this freshly freed land employs: fungi, fern, feather and fawn. Read more about Candice and view her nature photography.